And then Trump tweeted the following: “The workers who poured their souls into building this great nation were betrayed. But that betrayal is now over. … I’m delivering on a promise I made during the campaign.” This sent shockwaves through Ohio, Pennsylvania, West Virginia, Michigan, Wisconsin, states the Democrats thinks they’re gonna win back with ease. Shock waves are once again reverberating through what everybody used to believe were deep-blue states. RUSH: Leo Gerard, United Steelworkers international president, was exactly right. Thirty years ago, the Japanese began dumping steel. It was the late 1970s, early 1980s. We have a photo. 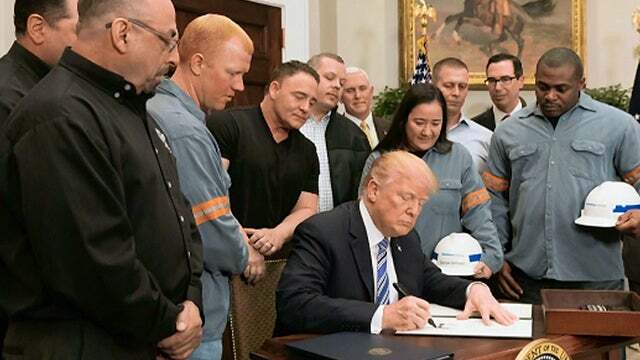 For those of you watching on the Dittocam, we have a photo of Trump signing the tariffs with the steel and aluminum workers surrounding him. Leo Gerard is the one predominantly left. He’s second from the left. You can’t see the guy behind his face. He’s the guy wearing the glasses closest to on the left. He’s the United Steelworkers international union president. But look at these guys, is what I want you to see. These are men. They’ll never make the cover of Variety or GQ or The Hollywood Reporter or what have you. But these are the guys. These are men. These are the type of people and their families that make America work — unheralded, unsung, unfamous, and not seeking to be. These are the people Trump made a promise to during the campaign, and he followed through on it yesterday. This is Ohio. This is Pennsylvania. This is Virginia, West Virginia, Wisconsin, Illinois. This sent quivers through the Democrat Party yesterday.